Corporate Governance in Chinese Listed Firms. Doktorarbeit von Hongmei Xu, Verlag Dr. Kovač 2015, 116 S.
The most significant step towards market-oriented reform in China was the establishment of the modern enterprise system. In order to meet the development of Chinese companies, the Shanghai Stock Exchange (SSE) and the Shenzhen Stock Exchange (SZSE) were founded in the early 90s. Meanwhile, Chinese companies have also been allowed to issue shares on foreign stock exchanges. As China continues to open its equity market to international investors, better corporate governance will become increasingly critical for Chinese firms. Therefore, this thesis chooses to discuss corporate governance in Chinese companies. Firstly, chapter 1 is the introduction, in which the main structure of the thesis is presented. Secondly, in chapter 2, the institutional changes in China are introduced, which will help in understanding the corporate practices of Chinese companies discussed in the following chapters. In addition, external and internal corporate governance mechanisms are briefly presented in this chapter in order to give readers an understanding of the basic situations of corporate governance in China. Thirdly, in the following chapters 3 to 5, the thesis presents empirical analyses on three core issues of corporate governance in Chinese companies. Chapter 3 discusses the relationship between corporate governance, state ownership and cross-listing in Chinese companies. On the one hand, nearly all reforms related to corporate governance in China have started in state-controlled companies. It is necessary to discuss how state ownership affects corporate governance in Chinese companies. On the other hand, according to the bonding hypothesis, companies from developing countries can improve their corporate governance by listing abroad. 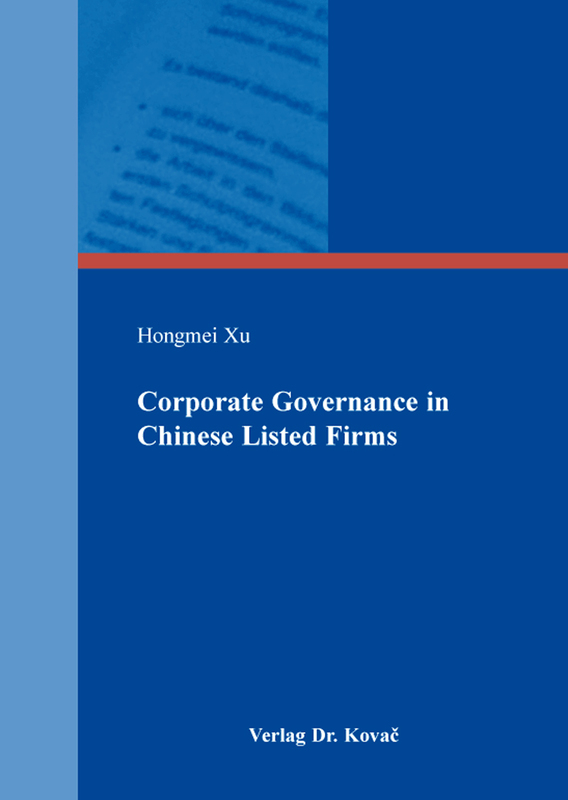 So chapter 3 also examines whether cross-listing can affect corporate governance in Chinese companies. Moreover, in Chinese listed firms, a two-tier board structure is requested to make sure that the management is better supervised and advised. However, the responsibilities of supervisory board members and independent directors are not clearly specified by laws and regulations. Therefore, chapter 4 investigates the role of independent directors and supervisory board members in Chinese companies more deeply and more specifically. Chapter 5 focuses on investigating the motivations of small Chinese firms for listing abroad, especially those listed on the Frankfurt Stock Exchange (FWB). Chapter 5 also examines whether the small Chinese firms listed on the FWB are motivated by improving corporate governance through bonding themselves to a more mature stock exchange.